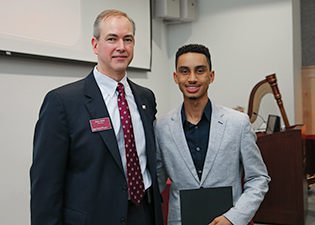 Freshman CoB student Floyd Howard, Jr, and Interim CoB Dean Jason Greene pose together after the Honors Day ceremony on Saturday, April 11, 2015. The College of Business handed out awards to its most accomplished students as part of the university’s Honors Day ceremonies across the SIU Carbondale campus April 11. President Randy Dunn kicked off the university-wide reception for all Saluki honor students at the Student Center ballrooms at 1:30 p.m., immediately followed by individual college ceremonies. As in previous years, the ceremony to recognize the College of Business’ most accomplished students for scholarships, scholastic honors, awards and other achievements took place in the Guyon Auditorium at Morris Library. Following a brief welcome and a few introductory remarks from the college’s interim dean, Jason Greene, and from Marcus Odom, professor of accountancy, more than 190 students received their academic honor certificates and Honors Day pins. Additionally, 19 students were separately presented with outstanding student awards for their excellent achievements inside and outside of the classroom. One such honoree was accounting junior Kennan Walsh, who earned his first award as a Saluki by being named the Kemper CPA Group LLP Outstanding Contribution to the School of Accountancy. Walsh, a current 4.0 GPA holder and member of the Accounting Society and Beta Alpha Psi, particularly embraced the motivational aspect that comes along with the honors certificate. “Considering the many extra hours I put in for our tax assistance service on Saturdays, it just really helps to stay driven and in the chosen path since you know you’re going toward something,” Walsh said. Ka Mei Chen, who was recognized as the Outstanding College of Business Student Worker. Shatozria Jangirawat, who was named the Deloitte & Touche LLP Outstanding Junior in Accounting. Joshua Lohmann, who earned the Ernst & Young LLP Outstanding Senior in Accounting Award. Olivia Grant, who received the Pricewaterhouse Coopers LLP Outstanding Senior in Accountancy Award. Emily Wiklanski, who was honored with the Uma Sekaran Award for the Most Outstanding Woman Graduating Management Major. Mahlon Lee Rich in Accounting. Elizabeth Auld in Business and Administration. Savannah McCord was also honored as the College of Business’ overall Outstanding Senior. Fellow senior award recipient Eleni Hampton, who was born and raised in a Saluki family, called the award a confidence booster. Lauren Hughes (Federation of Schools of Accountancy Outstanding Graduate Student). Scott Polczynski (Kemper CPA Group LLP Outstanding Contribution to the School of Accountancy). Meadow Chase (Most Outstanding MBA Student). Marcela Teixeria (Most Outstanding MBA International Student). Jennifer Manis (Pricewaterhouse Coopers LLP Outstanding Masters in Accountancy). Hannah McArthy (Asthagiri Chandra Sekaran Most Outstanding Female MBA Student). Emily Seay (Asthagiri Chandra Sekaran Most Outstanding Female Ph.D. Graduate Student). Chase, who said she intends to frame her award as a constant reminder to keep pushing forward, considers her recognition as Most Outstanding MBA Student a great honor. Fellow award recipient Seay, who was recognized as the Most Outstanding Female Ph.D. Graduate Student, had similar words of praise for the college and its faculty. And that’s one of the reasons why accounting junior Walsh discarded his initial transfer plans after joining the College of Business. Other event highlights of the SIU College of Business Honors Day 2015 included an inspirational keynote address by guest speaker and accounting alumna Elizabeth Kepuraitis; musical entertainment by Dr. Raymond Wacker, a retired associate professor of accountancy; and the recognition of the most outstanding student organizations, including the honor society Beta Gamma Sigma. Join the College of Business to congratulate all of our students on their excellent achievements inside and outside of the classroom!